I have already mentioned that insulation requirement is prohibitive for electricity generation at above 25 kV. But efficient long distance transmission is carried out above 220 kV, Again distribution and bulk utilisation of electricty is at or below few kilo volts. Of course the household requirement is at 415/230 volts. All these voltage conversion job is carried out by transformers. Now it is anybody's guess how the transformers populate the power system. Yes transformers are very important elements of power system. Transformers are used at the point of power generation, transmission, distribution and also utilization . Let us know some basics of transformer working principles. Transformers come in different shape, size and rating for different purposes. The transformers can be categorised many ways. We will do that as the situation calls for. However the basic principle of the working of transformer is always the same. Although the transformer is a very important element, but it works on very simple principles. consider the single phase ideal transformer as shown below. It has two windings. One can be called the primary the other secondary. 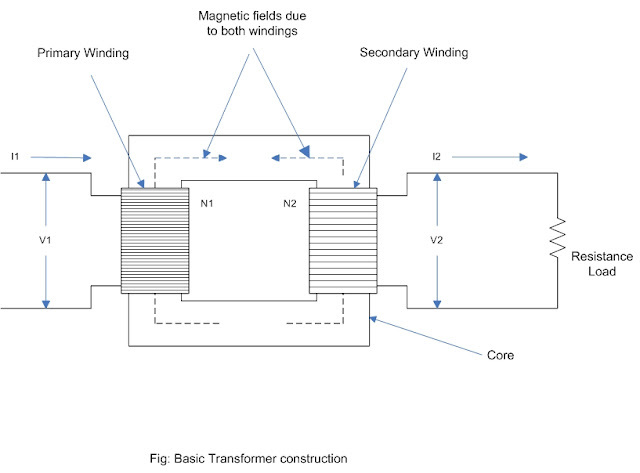 In actual transformer design, there are several configurations for winding. Both the windings are wound around the core. Each of the windings can have any numbers of turns depending on the requirements. Remember the windings are not electrically connected. let the primary has N1 turns and secondary N2 turns. Clearly the voltage across the winding is proportional to the number of turns. More the number of turns more will be the voltage generated. If a third winding of N3 turns is wound around the core, then proportionate voltage will be developed in this 3rd winding. The direction of I2 will be such so that the magnetic field created by I2 will oppose the direction of magnetic field created by I1. 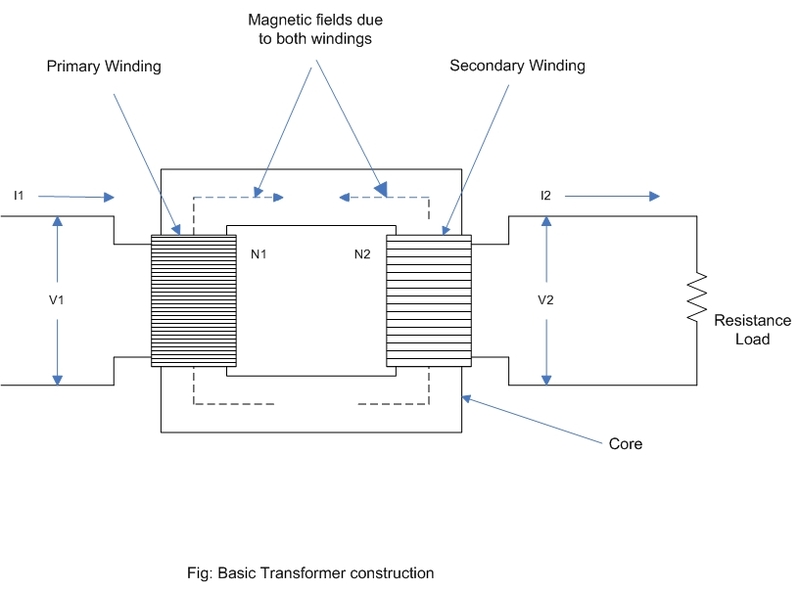 In the figure the magnetic fields due to both the windings are shown to exist separately in the core, actually in real transformer net magnetic field is established in the core. Observing above equation, we can say that more current will flow in winding with less turns. So both the primary and secondary have the same VA rating, which is the plate rating of the transformer. Although the above equations are for ideal transformers but they can be applied for real transformers because the result obtained differ only by a small percentage from the actual values. The above equations are often applied to practical transformers for quick estimate. The above ideal transformer can handle any amount of power, because the above ideal transformer is lossless, as we have not considered the resistance of the windings and the permeability of the core is assumed as infinite Both these parameters introduces losses in the transformers. Hence the transformer generates heat which ultimately decides the design of the transformer for a certain power handling capacity.Certainly from design point of view the resistance of the transformer windings cannot be neglected and finite permeability of the magnetic material is considered. 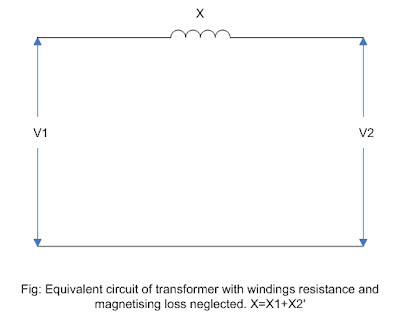 The practical transformer equivalent circuit diagram after neglecting the magnetising current is as shown below. 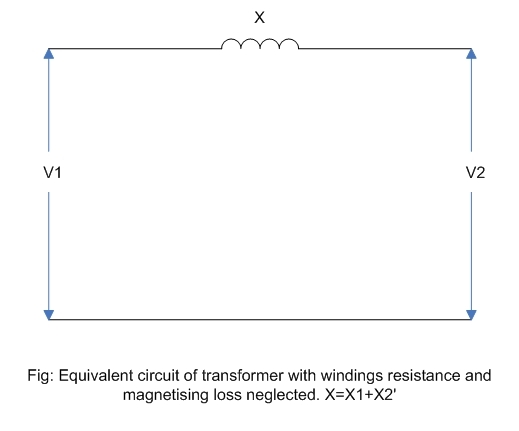 For a transformer the winding resistance is very small in comparison to the leakage reactance, so the resistance can be neglected in comparison to reactance. Hence for analysis of power system, transformer can be modeled as an element of certain reactance as shown below. X2' is not same as X2. X2' is the secondary winding reactance when referred to primary. Load is also the secondary value reffered to primary.These secondary values when referred to primary, the original secondary resistance /reactance/load are multiplied by (N1/N2) squared. A power transformer normally consists of a pair of windings, primary and secondary, linked by a magnetic circuit or core. When an alternating voltage is applied to one of these windings, generally by definition the primary, a current will flow which sets up an alternating m.m.f. and hence an alternating flux in the core. This alternating flux in linking both windings induces an e.m.f. in each of them.